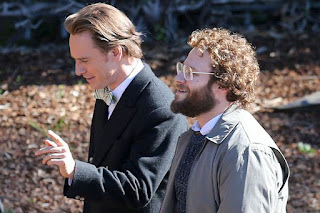 There have been a few movies that have tried to depict the life of Apple, Inc. co-founder Steve Jobs, but none of have them as been as satisfying as director's Danny Boyle's new film. Aaron Sorkin (The West Wing, Social Network) wrote the screenplay based on Walter Isaacson's biography of the same name. The story concentrates on the three iconic product launches from 1994 to 1998 interspersed with flashbacks. The relentless dialogue keeps your brain hopping as it covers Job's career high and lows, his manipulative but infectious energy, his visionary outlook, and his dysfunctional disconnection with human beings, particularly his daughter. Issues have come to light on the inaccuracies of how Jobs is is portrayed in the film that many of the situations in the film are fabrications and creative liberties. But in the end, the complexities of Steve Jobs would be hard to tell in a linear format. Boyle and Sorkin found a unique story concept that is entertaining rather than historical. Michael Fassbender makes Steve Jobs come to life with an intense energy. From the early years of working with Steve Wozniak (Seth Rogen) in his family's garage, to the launching of the MacIntosh, NEXT and the iMac. Their long time friendship is often argumentative. Kate Winslet plays Joanna Hoffman who is in charge of marketing of the new products. She would often win in-office prizes for being the only one who could endure working closely with prickly Jobs for any given time. The movie starts with Jobs wanting the MacIntosh to say “hello” during the launch. His engineers are subjected to his verbal onslaught of threats and bullying. He is unrepentant and absolutely sure he is right in his conception. Jeff Daniels plays John Sculley the CEO of Apple who later fired Jobs when the MacIntosh failed. While his world is centered on getting the computer on the market, the day is made even more complicated by his former girlfriend Chrisann (Katherine Waterston). She wants Steve to acknowledge their 5 year old daughter Lisa even though Steve stubbornly insists there's only a 94% chance that she is his. (Lisa is played by Perla Haney-Jardine, Ripley Sobo and Makenzie Moss at different ages). She is a bright child and despite Job's reluctance to accept parentage, he agrees to help finance her existence. (In real life, Lisa lived with Jobs through high school). The term Reality Distortion Field was a term coined by Bud Tribble at Apple Computer in 1981. It came to describe Jobs' effect on developers with his charm, bravado, hyperbole, and persistence. He was able to convince his employees to become passionately committed to his new projects, even making them think it was his own idea when it came from someone else. This film really shows how his single minded vision for his “closed system” computer changed the world while rubbing people the wrong way through the years. Performances are first rate, particularly Fassbender and Winslet who tear up the screen. Their conversations zing back and forth like a tennis match. It's impressive to watch and listen. So what if the movie isn't an historical correct. It's a wonderfully written and acted piece of movie magic.